Can businesses have both acquisition and retention dominant in their corporate DNA? Discover what strategies Banking and Finance prioritise, how Advertising and Marketing view their position, learn what Manufacturing view as important and what is less important to their strategy and how the Insurance sector plan to tackle the competitive broker arena. Customer Attuned and its partners carried out an international research study over the summer to explore what will be the defining characteristics of B2B customer management (CM) strategy to 2018. Senior professionals with CM responsibility were targeted in companies or business units that are B2B. 105 people responded representing fifteen different sectors. The Customer Attuned Assessment (CAA®) model has twelve “golden threads” of critical B2B capability across knowledge, strategy, planning, implementation & results. 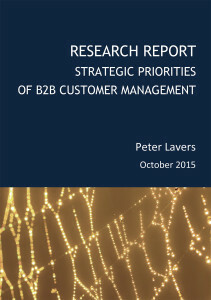 B2B companies should read this report and develop their own strategies for customer management excellence – especially if they aim for both Hunting and Farming to be defining characteristics of their corporate DNA.